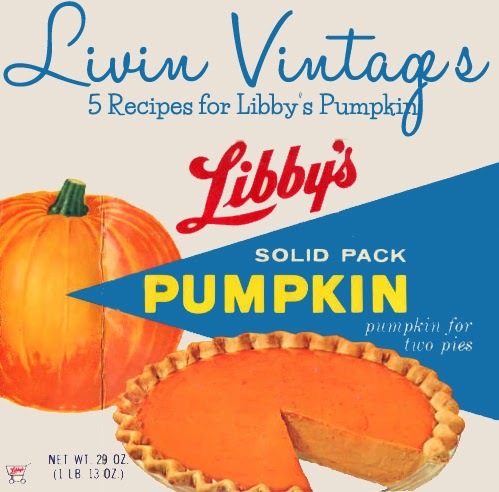 Libby's introduced its now famous canned pumpkin in 1929. Since then, cans of Libby's canned pumpkin starts to fly off the shelves of grocery stores this time of year. While pumpkin pie is a traditional take on canned pumpkin, I thought it would fun to take a look at five different vintage/retro recipes that utilize this seasonal goody. This sounds so delicious! And it would be really easy to veganize too! Just swap out the butter for shortening and the ice cream for a soy or coconut milk based ice cream. 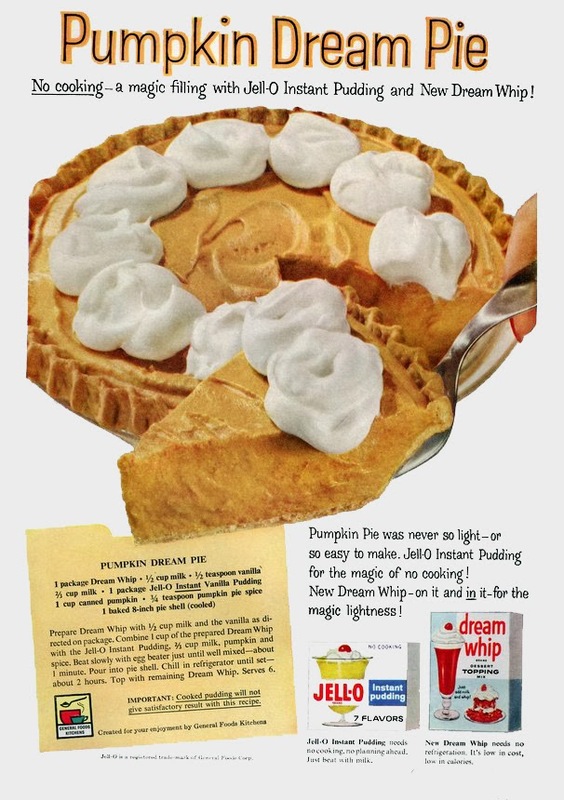 I think this pie would be a nice twist on the usual pumpkin pie that so many of us enjoy on Thanksgiving. Plus, it's an ice box pie, so there's no cooking involved! This is another twist on the pumpkin pie. One pie I really do enjoy is coconut cream pie and this pie seems to be a hybrid between a pumpkin dream pie and a coconut cream pie. This might be my contribution to Thanksgiving dinner! Preheat over to 350F. Combine flour, oats, baking soda, cinnamon, and salt. Cream butter; gradually add sugars, beating until light and fluffy. Add egg and vanilla; mix well. Alternate additions of dry ingredients and pumpkin, mixing well after each addition. Stir in morsels. For each cookies, drop 1/4 cup dough balls onto lightly greased cooked sheet; spread into pumpkin shape. Bake 20-25 minutes. Yields 19-20 cookies. These cookies with the lemon icing sounds interesting! If anyone tries them, I'd love to know how they turn out! Have you entered the giveaway for $25 to Livin' Vintage Shop? Check out this post to find out more! They all sound so yummy! 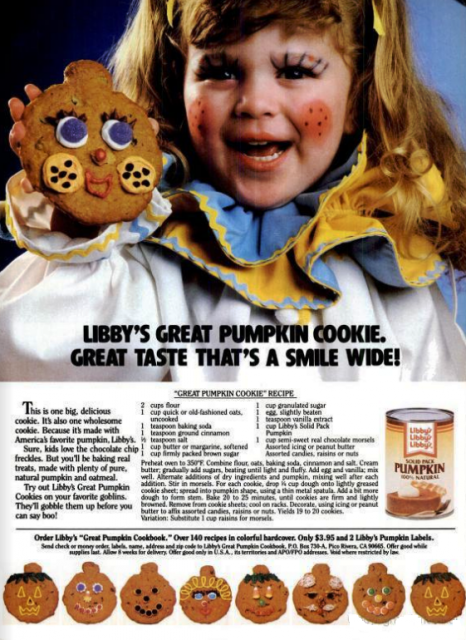 I remember the pumpkin cookie advertisement with the little clown girl from my childhood. Good memories. Thank you for posting. 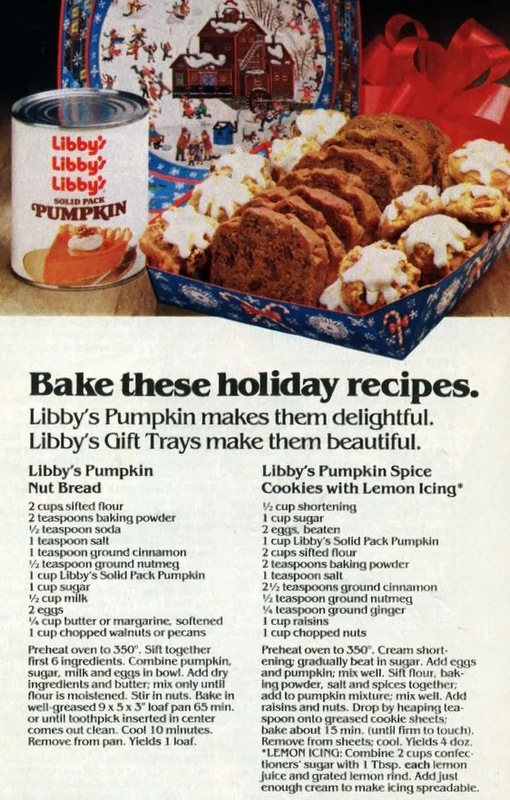 Ah, the classic Libby recipe. I've never used any other recipe because it is such a tried and true classic, but a family favorite of ours is to bake one of the pies with a layer cranberry sauce on the bottom. Coconut pumpkin pie sounds amazing!